‘Denti’ is the Italian for ‘teeth’ but Piergiorgio Milano has not created a work about this particular part of our physiognomy but rather around it. Teeth are resistant and sensitive, qualities that Milano brings to the work, and his grandmother taught him that to dream of losing your teeth signifies the subsequent loss of someone close to you. One night Milano dreamt of losing his teeth and the next day his grandmother passed away. This kind of circle of circumstances, of manifestation and extinction, memory and loss, is what Denti represents, invoking a circular space where reality and dream are looped together without possibility of resolution. It is perhaps no accident that Milano slowly enters the piano nobile like an insect hiding under a tattered raincoat, as if he were an alter ego of Franz Kafka’s Georg Sama. The initial stealth, however, soon gives sway to a surge of movement that appears to give the coat an independent animation. Milano treats it with both violent incomprehension and as a tender memory of another being, long gone, who can nevertheless still wrap him in her familiarity and scent. The two pieces of music that Milano uses also suggest memory and loss: the first one is an old 78 recording of Enrico Caruso singing the aria Je Crois Entendre from Bizet’s The Pearl Fishers, and the second is Valzer di un giorno by Gianmaria Testa. Milano makes the crackling sound of the 78 the dense medium through which he plunges his body into memory. 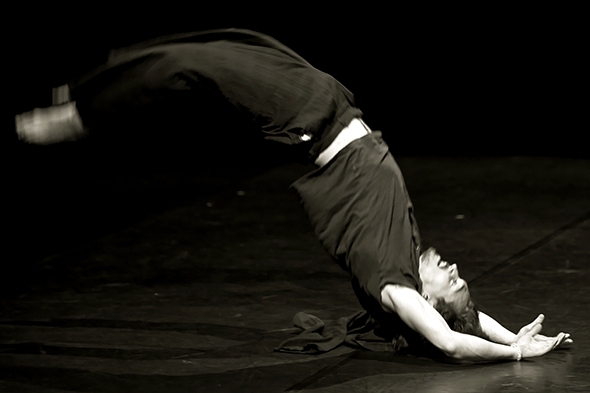 He is trained in circus and has the physical vocabulary to use every part of his body to make circles, to somersault, to undulate, to spiral and to curve; it is the flow of his movement that carries the emotion of the performance. The classical proportions of the piano nobile seem to struggle to contain these turbulent eddies, but Milano has also learned how to swim through hard surfaces, kneading the wooden floor with the resilience of his body to make it curiously soft; he moulds the floor to his will and leaves us to experience the shapes he has made. Both water and air are his metaphors; his choreography is like a stormy current let loose on a weightless body until the weight finally returns with the body’s stillness. In a humble gesture of resignation Milano bows, and remains bowed with his alter ego coat obscuring his head. It’s hard to applaud after that.